Yesterday I played in a casual game with @Darth Merkat. He brought Tarkin, a Kuat, and 3 x Arquitens. I brought Demolisher, a Quasar, two Gozantis, Dengar, and max TIE Bombers. With initiative, he choose to be second player, and I picked Hyperspace Assault from his objectives. After deploying obstacles, him setting aside an Arquitens for the objective, and setting up his objective tokens, we ended up deploying relatively across from one another on the table. It seemed like he intended to turn his Arquitens in Round 1 for the massed broadside attacks in Round 2, bring his Kuat in to flank, and hyperspacing in his Arquitens behind or to the side of Demolisher. I choose to put Jerk Gozanti across from the Kuat to prevent it from flanking while making sure that my bombers were in position to pounce on the ship hyperspacing in. Round 1 – No surprises here. I moved all my ships slightly forward, with Demo moving at speed 3 and using Engine Techs to get into attack position. He turned his two Arquitens to broadside and began turning his Kuat to flank. Jerk Gozanti was at speed 1 with a Nav token ready to bump up to speed 3 in Round 2 to block the Kuat. Round 2 – Round 2 started off with him hyperspacing in the Arquitens behind my Demolisher (and to the port side of my Quasar) and with me turning over my first Thrawn dial (Squadron command). I activated my Quasar first and pounced on the Arquitens that just joined the battle. After leaving it with only one hull remaining, he activated it, causing minimal shield damage to surrounding ships, and then pulled along Demolisher’s port side. I next activated Jerk Gozanti to bring him into position to block the Kuat as well as to get him into range for Bomber Command Center to be able to cover all my bombers in Round 3. Kuat activates, rolls about eight damage and an accuracy, I use Electronic Countermeasures to Scatter, and @Darth Merkat wants to rip Minister Tua in half. Sorry (Jerk Gozanti, right?). Luckily, the Kuat barely makes it past Jerk Gozanti, which at least keeps him in the fight and not stuck in that position as Demolisher starts to turn towards it. He activates the farside Arquitens and causes no damage with his unreliable red dice (after defense tokens). I activate normal Gozanti, whose activated TIE Bombers finish off the Arquitens that hyperspaced in. It finishes its movement right into front of the center Arquitens and slices its top command dial to a Squadron command. The center Arquitens returns fire on the Gozanti, which it scatters, then rams it for one damage (and subsequently keeping it in place for Demolisher’s attack run). Demolisher activates two TIE Bombers to go after the far side Arquitens. Then Demolisher attacks it, bringing it to two hull as it is poised to run away. After moving, Demolisher attacks the center Arquitens with its side armament, bring it down to two hull. The unactivated squadrons move into position to take down both Arquitens in the next round. Round 3 – I turn over my second Thrawn dial (Squadron command) and then use Hondo to give Demolisher an Engineer token and the Quasar a Squadron token (one of his Arquitens gets a Concentrate Fire token, but unfortunately, the Engineer token is lost due to every one of his ships already having one from Tarkin). I activate the Quasar, which uses TIE Bombers to take down both of the remaining Arquitens. The Kuat activates and begins to aggressively flak my TIE Bombers, rolling very well and bringing most of them to three hull. At this point, upon receiving their Squadron command, all TIE Bombers start attacking the front and starboard sides of the Kuat, while Demolisher starts shooting at the Kuat’s rear hull zone. Round 4 – Third Thrawn dial is turned over (Squadron command). TIE Bombers continue to swarm the Kuat, bringing it down to five hull remaining by the end of the round. Kuat continues to flak with good dice rolls, bringing almost all of my TIE Bombers to one to three hull. Terrible movement by Demolisher leaves it with no second shot. 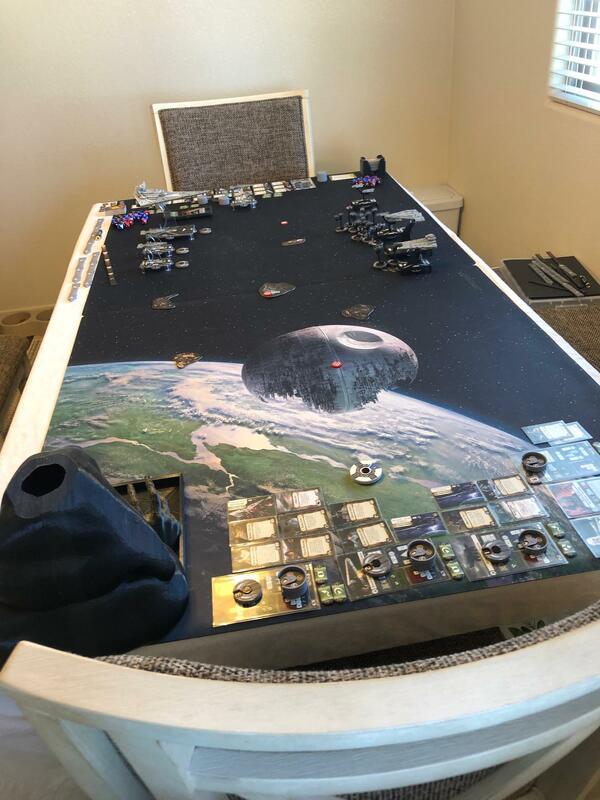 Round 5 – The Quasar activates and the TIE Bombers take the Kuat down. 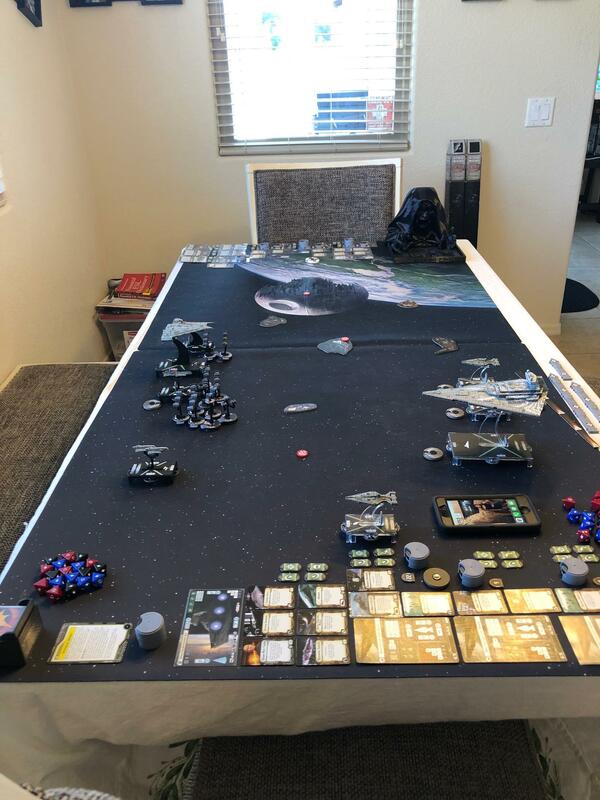 Tarkin tabled for a final score of 400-0 (10-1).This was a pretty quick game and it illustrates what can happen between two mismatched fleets, especially if one is heavily invested in bombers and the other is squadron-less. I felt kind of bad that the fleets were so mismatched before we started deployment, but things could have gone very badly for me if the Kuat had gotten into the fight earlier, especially if it got close to my Quasar. I guess I need to be prepared for his heavy squadron build for our next game (which means that I probably should get a Sloane or Rieekan Aces build ready). I thoroughly enjoyed using Demolisher for the first time, especially using bombers to soften up a target (and get it to use Redirect and Contain tokens) before attacking with its plethora of black dice. Looking forward to using this combination in the future with Maarek and Jendon. 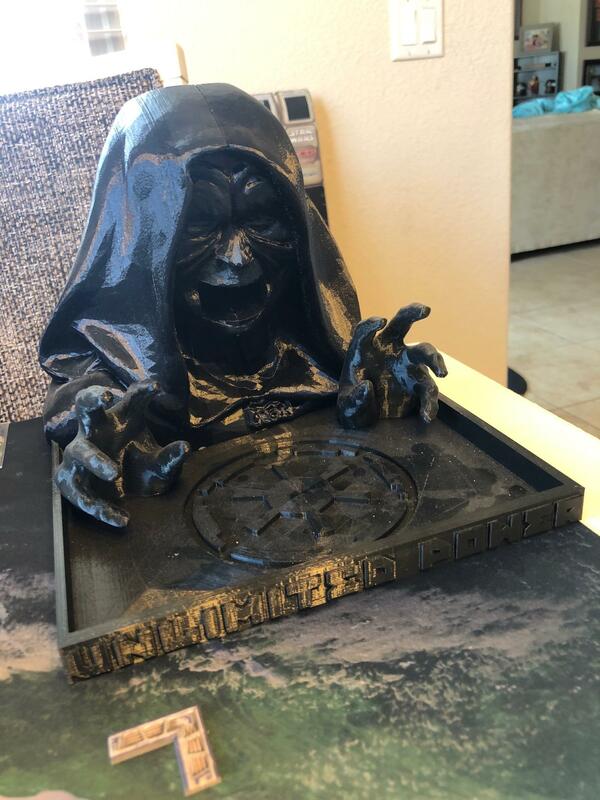 Also, that is @Darth Merkat's Emperor Palpatine dice tower that he had 3-D printed. Unfortunately, The Senate did not help his dice rolls. Hope you enjoyed this BATREP! Holy Formating error... At least on Google Chrome. After fixing the formatting issue, here are the lists for this match. Being a huge Tarquitens fan it can be weak against squads. I'm also not sure I'm much of a fan of this Tarkin setup. I just don't see what Tarkin's value is, there just are not enough Token effects. That said if I was flying Tarkin vs that list I would have had to Bull Rush the Quasar, if I could kill it I'd keep my fleet at max speed and split them up. Vs bombers like that you need to fly fast and kill the main carrier as quickly as possible. Hyperspace Assault also doesn't seem like the best choice for that list. Yeah, the deployment advantage really helped with keeping the Quasar away from harm, especially away from the Kuat. It was his first time running Arquitens, just like it was my first time running demo. While really fun, especially with a Tarquitens build, they do seem to have more of a learning curve to optimize then Demo. My only suggestion with a Tarquitens build is you have to get good value from those Tokens, that to me means more than just the standard token effect. Currently Support Teams are the best way to do that with Engine Techs, Nav team, or Projection Experts. There are other cards that make tokens more valuable as well like Repair Crews on a Flotilla or any of the Fleet Support Upgrades. The Sovergien ISD title also makes Tarkin Tokens much more valueable as well. In the future Krennic will be a nice option for an Arquitens as well. The one issue with all of this is that Tarkin is an expensive commander and building Arquitens this way make them relatively expensive as well which limits your options. Add that to the ISD with Intensify Firepower and that is basically your list. I do have another idea for a Tarquiten build which doesn't use the ISD. One Arquiten has Kernnic with Enhanced Armament and ET, One has Needa with TRC and ET, Another has Grint (CF Token) with QBT and ET. This gives them all some Red Dice mitigation but at that point you are already at 275 points... You could fill the other points with Rogue Squads, a Demo, another Arquitens, or a couple flotillas. But does it pack enough punch? If the Arquitens can stay at long range, maybe. If your opponent can swarm them with squads or get into close range the Arquitens are toast. What I love about Engine Techs is not only do they give Arquitens a 2 click manuver at the end of their move but they also allow you to change speed as well, this helps them stay at long range.